Dianne Reeves oozes earth-deep soulfulness. Everything about her - from the way she sings to the way she speaks - is soulful. Warmth, diamond-like precision and generosity, in her music and in her approach to the world at large, make her the sort of artist that is a delight to hang out with. This is important to Reeves' appeal. She can sing up and down the scales, interpret any song in a style that will stun you and still keep it real. What makes Dianne Reeves so mesmeric is the humility that underscores the mastery. Conversations about jazz masters tend to have a masculine cadence. Dizzy Gillespie, Monk and Miles Davis are rightly spoken of in breathless tones. Even Nina Simone, who viewed the world through a womanist lens, often spoke only of men when discussing masters. Female jazz musicians are deemed divas - a term that has a dismissive tone to it. It is telling that when Terri Lyne Carrington, the genius drummer, composer, record producer and professor, won the Grammy Award for best jazz instrumental album in 2014 she became the first woman to do so. With that context in mind, I'll posit this: Dianne Reeves is one of our generation's definitive jazz masters, a vocal stylist of extraordinary skill and vivacity. This vivacity comes through during our conversation. I ask Reeves about the five year wait between her previous album, When You Know, and her latest offering, Beautiful Life. "I don't feel like it's been five years," she says, "because I've been doing so many other things. Some people think that all you do is record and it's not the case. You take on other projects as well and you have to live a little bit because it inspires your work." "The new record was about transitions. I had experienced a lot of losses these last couple of years and I always turned to music to guide me through. I'm still trying to keep that element of hope and faith. There was a tinge of sadness in Beautiful Life because of the losses - not just of loved ones - but the way life changes." Beautiful Life is a gorgeously constructed record that infuses the syntax of classic jazz with the sound of modern soul. Its grown-folks music in an age of digital group-think and desensitization. Reeves, however, is excited about the new generation of artists and thinkers. "There are so many great young people out here who are just changing everything," she says. "The music industry is changing. You only hear a sprinkling of big names but there are a lot of really wonderful, young musicians with great voices and lyrical content who have refined their sound. They're up in here so don't think they're not. There's this wealth of talent below the surface that's ready to explode." She's always been a huge supporter of up-and-coming talent as well as her peers, citing Laura Mvula, Lalah Hathaway, Lianne La Havas, Terri Lyne Carrington, Gregory Porter, Robert Glasper and The Floacist as especially thrilling voices. Even her take on the music industry, which has always been rampant with misogyny, is refreshing: "I think the industry wants female artists to be a certain way but these musicians are coming as they are; strong, intellectual and talented. They're saying, 'This is me' and I love that." One of the highlights from the new record is a delicately textured rendition of Fleetwood Mac's "Dreams". "I knew what the story behind "Dreams" was," says Reeves. "It was about Stevie Knicks' relationship. But when I sing it it's about sharing some sage advice with somebody. The song was important for me to sing because it related to someone in my life, under my guidance, who I was telling, "Look, you need to get real."" 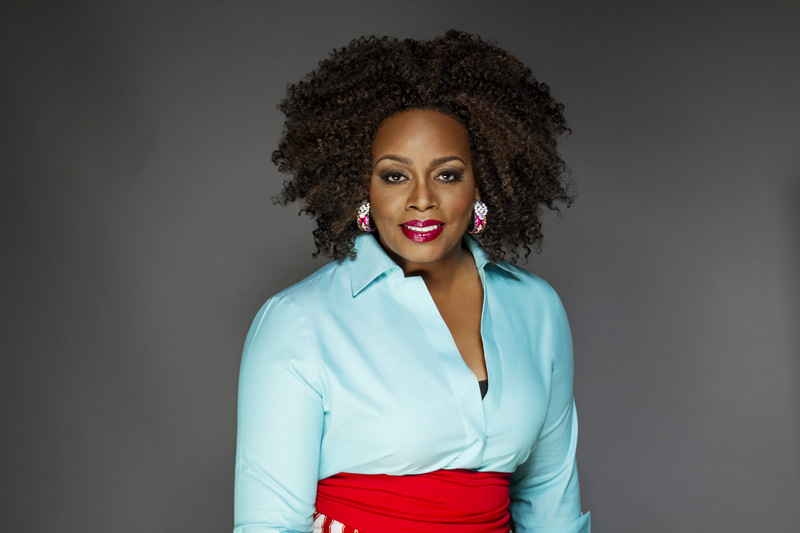 It is this lack of artifice that has ultimately shaped Dianne Reeves as an artist and as an individual. Content at home in Colorado, she enjoys the simple pleasures that constitute a decent quality of life: everything from cooking to hiking to gardening to watching Game of Thrones. Hearing her speak from a place of balance and joy reminded me of Hemingway's brilliant line, "Happiness in intelligent people is the rarest thing I know." Dianne Reeves debunks this myth, and all I kept thinking, long after our conversation was over was, Ain't that a beautiful thing. Dianne Reeves' Beautiful Life (Concord) is out now. You can connect with her on Twitter and Facebook.